This time, I want to try a more positive approach to card review. Instead of explaining where to put cards, I want to talk about what would need to happen to make them good. Normally, I just explain where cards could fit into existing decks, but that discounts a lot of potential. It doesn’t encourage experimentation. Unfortunately, there was a banned and restricted announcement after I was finished writing out my article. 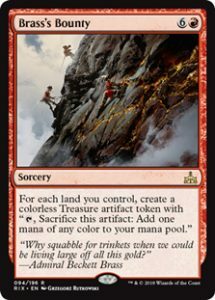 I certainly referenced Ramunap Red and Energy when talking about several cards, but I did try to find homes for a lot of these cards outside of those decks. I’m not sure what the metagame will look like after the bannings, but I expect Search for Azcanta decks to get a significant boost. Not much else to say, it’s spoiler season. Time to dive right in. We’ve seen several three mana counters recently. Raid is tricky, as the decks most likely to run this are the least likely to trigger the discount. 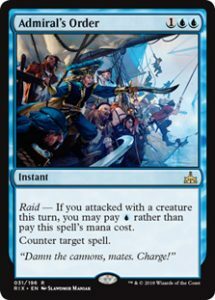 Admiral’s Orders works well as a protection spell for anything you are casting on your second main phase, like a planeswalker. Getting a hard counter for a single mana is a steal there. Disallow has a proven track record, so you need to consider how many creatures you have for Raid before contemplating a switch. Angrath, the Flame-Chained has a devastating plus ability against control decks. Constantly picking apart their hand with some bonus damage is really tough to beat. The minus is alright, but it feels like rather weak protection for a five mana planeswalker. Threaten is really only good the turn you can kill someone with it, and attacking with a stolen creature is not likely to end up with it dying in combat. Killing smaller creatures is a nice bonus, so the protection isn’t as bad as it could be. Finding a home for Angrath could be tough. 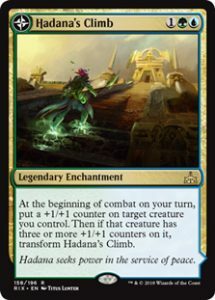 Red already has an abundance of riches between Hazoret and Chandra at four mana, and Glorybringer already rounds out the curve on that deck. That red deck is looking to end the game before Angrath can realistically contribute. The other Chandra deck in the format, the dreaded Temur Energy deck, currently splashes black for The Scarab God, Vraska, Relic Seeker, and sideboard Duress. Energy doesn’t really want Angrath for the mirror, as cards in hand are weaker than the threats in play. Where Angrath is likely to shine is out of the sideboard. It preys on decks filled with Disallows and Azor, the Lawbringer. 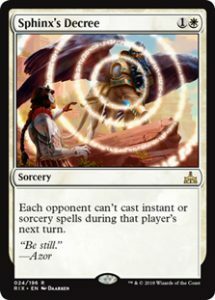 It’s not awful against Energy decks if they decide to slow down, but there is a long list of possible sideboard cards there (which are often more of side-grades than upgrades). If you want a planeswalker against a Search for Azcanta deck, Angrath, the Flame-Chained has your back. Lands that say “Draw a card” always deserve a second look, no matter how bad they look. Ascend is the real question here, as we won’t have a great idea how easy it is to trigger without some significant testing. 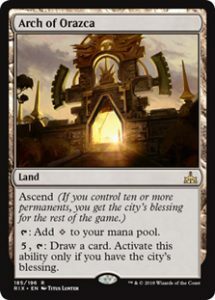 If you build a deck capable of getting the city’s blessing, Arch of Orazca might be worth squeezing in a miser’s copy. If you can afford the colorless mana source, that is. (I don’t think Energy currently can). There are a few hits against Awakened Amalgam. It always dies to Abrade. It doesn’t have any keywords. It’s also got the chance to be a four mana 1/1. I think your deck can’t realistically be playing more than a couple copies of any land to work with Awakened Amalgam. 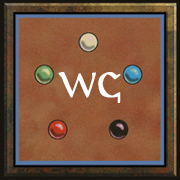 This might be a card for five color commander decks. We can start with the sweet payoff; if you can flip Azor’s Gateway, you should probably win the game. It’s tough to do better than a land that taps for 6+ mana. 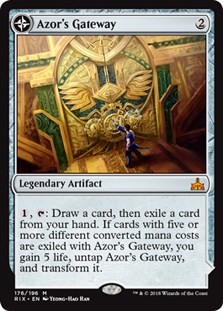 However, flipping Azor’s Gateway is gonna take at least five turns. More importantly, you’re going to take some virtual card disadvantage every time you activate and draw a land. Throwing away spells is a massive cost, on top of the deck building requirements to have sufficient CMCs from one to five. You’ve got two options with Azor’s Gateway. The first is using it as a repeatable loot effect. 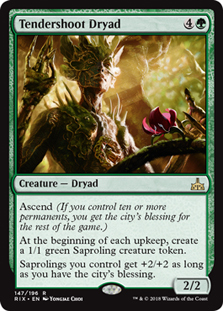 It’s cheap enough to drop early, but it’s gonna compete with Search for Azcanta for deck slots. 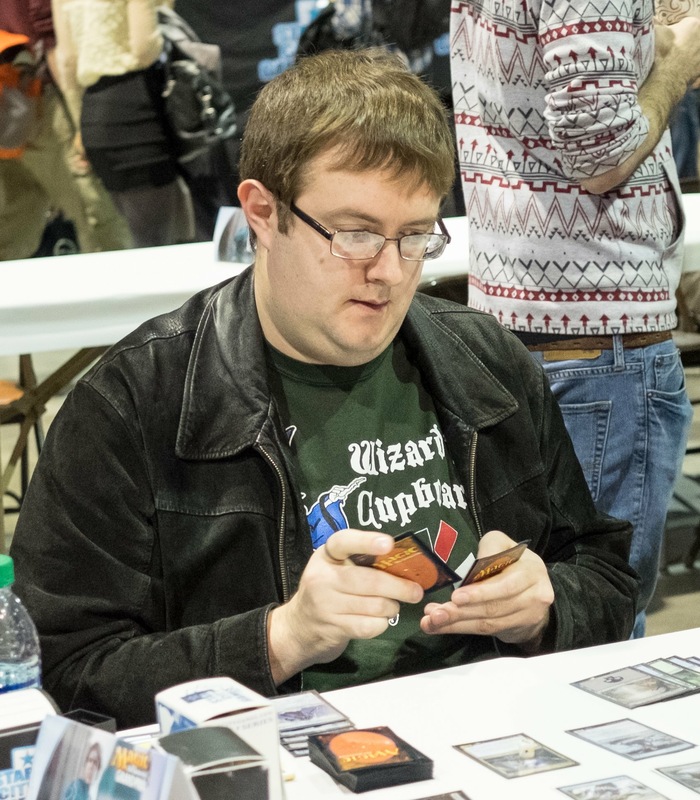 The other way is to go all in on flipping Azor’s Gateway. 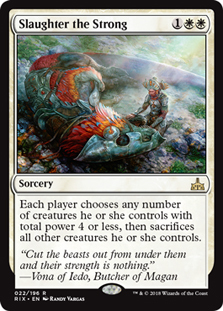 Cut//Ribbons seems like a great way to finish someone off if you find the Sanctum of the Sun. Azor is fighting for a slot as a control finisher. The positive is that Azor does some work to protect itself and it has a sweet combat trigger. The bad is that Azor doesn’t completely protect itself and the timing for the combat trigger is rather unfortunate. The protection keeps Azor alive for the opponent’s turn, barring Ravenous Chupacabra and Vraska, Relic Seeker. Unfortunately, it doesn’t keep Azor alive through its first combat step, since there is a gap for instants to kill it between your upkeep and combat step. You do have your mana available again, so you’ve can protect it. Firing a Sphinx’s Revelation off at the end of combat is a little awkward too, as you either skip drawing the maximum number of cards, or you can’t leave mana up for counterspells. 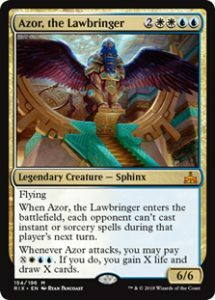 Azor, the Lawbringer is going to struggle to find a home until Torrential Gearhulk rotates. 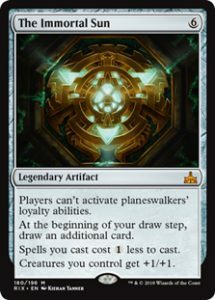 Gearhulk’s immediate value is tough to rival, particularly with several cards legal that kill Azor for significantly less than it costs to cast. I could see it being part of a creature sideboard package for the U/W approach decks. Fairground Warden is legal currently, so you either need to care about creature type or the stat bonus enough to pay an extra mana. 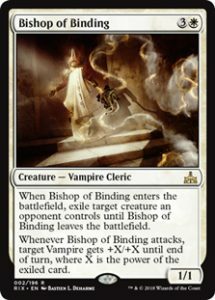 I would expect the best opportunity for Bishop of Binding to see play would be as a tutor target for Forerunner of the Legion. 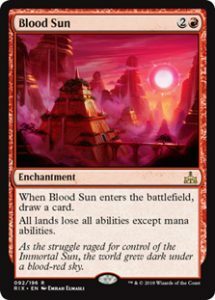 In Standard, Blood Sun hits a handful of fairly powerful lands. None of them are prevalent enough to warrant maindeck inclusion of Blood Sun, but it’s a fine sideboard card against Search for Azcanta and friends. Modern has some stronger uses for Blood Sun. 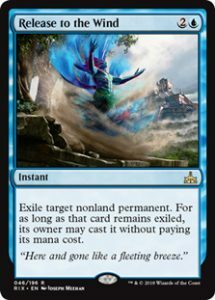 Shutting off fetch lands is a huge deal, and the positive interaction with the Ravnica bounce lands is incredible. I expect the card will show up in multiple places. I suppose if you’re looking to win games with Revel in Riches, Brass’s Bounty might be useful. Costing three mana is going to make Captain’s Hook difficult to use for Standard. The +2/+0 is too expensive for a three mana equipment with an equip cost, so you’ll need a reason to give a creature Menace or the Pirate creature type. 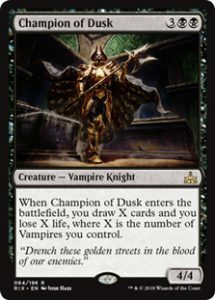 If your Vampire tribal deck is looking for some card draw, Champion of Dusk might do the job. Needing to retain a board to get significant cards can be a challenge, but anything over two cards should make Champion of Dusk a solid card. Four mana is a lot, particularly since Crafty Cutpurse doesn’t steal tokens for more than a turn. 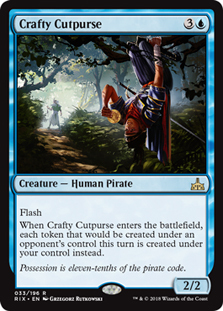 If your opponent has some sort of combo that just dumps out a ton of tokens, Crafty Cutpurse could make a good sideboard card. I’m not rightly sure where you might want Dead Man’s Chest, but I love the flavor of the card. Gonti, Lord of Luxury has a similar effect, but you only get one card and the 2/3 deathtouch creature. 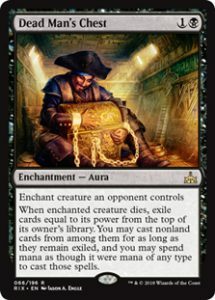 Dead Man’s Chest can give you a ton of cards, but you have to get it on a big creature and still get rid of it to reap the rewards. 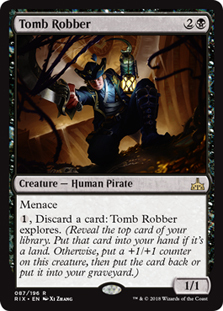 Dead Man’s Chest might be a good option if stealing specific cards from an opponent will significantly handicap them. The best example that comes to mind is Approach of the Second Sun, but they don’t run creatures to target. This looks like a problem for a brewer. 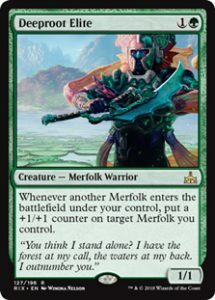 Deeproot Elite has exactly one home (Merfolk deck), and it’s a great fit there. 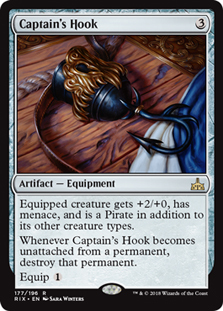 I can’t imagine a Merfolk deck that doesn’t run this card. Unlike Metallic Mimic, the counters go exactly where you need them the most instead of a creature with summoning sickness. 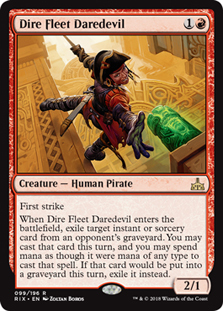 Heralded as the red Snapcaster Mage, Dire Fleet Daredevil certainly draws that comparison. Stealing spells from your opponent is a little worse, since you can’t rely on them having the kinds of cards you want. That said, it’s hard not to get some value if you want it. If you’re just looking to get cards out on curve, a 2/1 First Strike creature for two isn’t the worst deal ever. Dire Fleet Daredevil probably needs a new home outside of Energy and Ramunap Red. 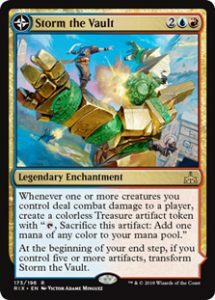 Ramunap Red wants a two drop that deals a little more damage (Kari Zev) and Energy really needs to stick to cards on theme. Dire Fleet Daredevil wants a home in a slightly more midrange deck that isn’t a slave to the Energy theme. Dire Fleet Poisoner is an excellent card that has exactly one home. Pirates generally have some nifty ability, but their overall stats are quite poor. 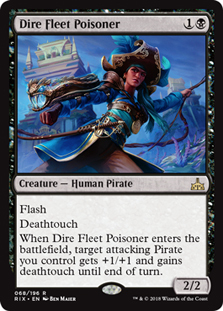 The existence of Dire Fleet Poisoner makes it difficult for opponents to block your Pirates, even if it looks like an unfavorable trade for you. If you have a Pirate deck with black, you should be running Dire Fleet Poisoner. The rate for Elendra, the Dusk Rose is quite poor as a 1/1 for four mana. This is an engine card, suggesting that you have a deck full of creatures that can be easily sacrificed. That, or you want a deck capable of effectively killing a bunch of your opponent’s creatures. 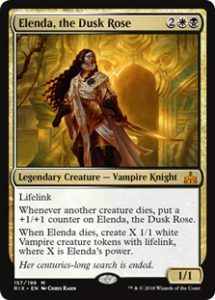 If some kind of Aristocrats deck appears, Elendra would be a good way to profit. 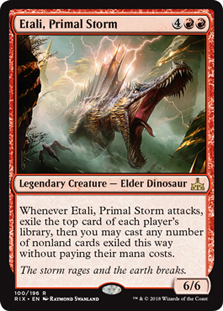 This card is sweet, but I’m worried that Etali, Primal Storm is a little too weak to see competitive play. You really need Etali to survive long enough to attack, or you are going to be down a significant amount of tempo. If you want to work with Etali, Primal Storm, I’d suggest paring it with Regisaur Alpha. Form of the Dinosaur is a sweet callback to Form of the Dragon. The big difference is you don’t get a heal each turn, so the fight ability can get dangerous if the game stretches on for a while. 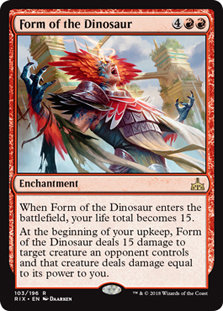 Form of the Dinosaur is some good value for a slower red deck, but it needs a home outside of Energy or Ramunap Red. Ghalta, Primal Hunger looks promising from some initial testing. If you can drop the cost down to three or four mana, Ghalta is a great threat. The real trick is dropping the cost enough to justify it. Vanilla creatures need to be a great deal to warrant a spot, so I’d lose interest quickly if you can’t keep the cost lower than five or six. Once again, Regisaur Alpha is an excellent card to pair with Ghalta. I’m not really sure what to do with Golden Guardian. 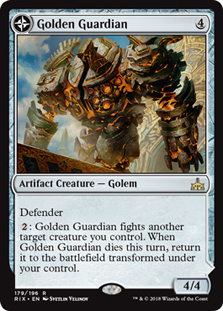 It needs a big creature to help it flip, so you have to run something like Torrential Gearhulk to give a target. It has Defender, so it makes for a poor creature in all but the slowest decks. It’s also weak to Abrade, so it’s not even a guaranteed threat against Ramunap Red. Overall, Golden Guardian seems like a low power card. I look forward to a brewer proving me wrong, as churning out 4/4 creatures every turn looks like fun. 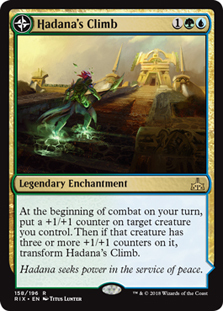 Hadana’s Climb looks like a fairly powerful card with a couple potential homes. The first possibility is Energy, since Longtusk Cub and Bristling Hydra both generate plenty of counters. Energy has plenty of places to put +1/+1 counters, and the flip side is a good way to close out a game. The other possibility is Merfolk, since plenty of those cards generate +1/+1 counters naturally. That deck will be happy to flip Hadana’s Climb and start using an improved Berserk every turn. Huatli, Radiant Champion is not like most Planeswalkers. If you put her in your deck, you ideally want to ultimate her the turn after you get her in play. That means she needs a deck filled to the brim with creatures and tokens. You need enough creatures to get +5 loyalty on the plus, along with enough creatures to start drawing cards after you get the Emblem. I didn’t really mention the minus ability, but that’s because it shouldn’t come up that often. I would typically ignore it unless you can bring an opponent down to critical life or simply kill them with a single activation. 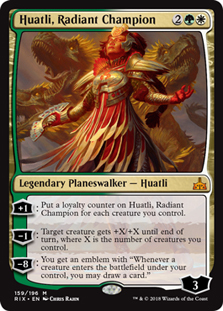 Huatli’s main job is going to be generating value in mirrors or slower matchups. Induced Amnesia is a great way to filter your cards. 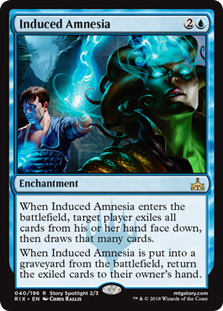 If your deck is capable of drawing a bunch of extra cards, Induced Amnesia is a great way to mitigate clumps of lands or dead cards. I wouldn’t be surprised if a control deck played a copy or two of this card, and it’s exactly the kind of effect that combo decks are interested in. Approach of the Second Sun comes to mind, as Induced Amnesia is a great way to dig down to the second copy. 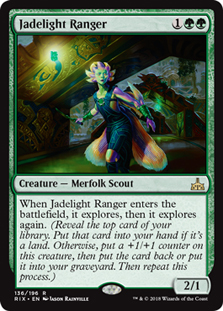 If you’re in the market for a midrange threat that generates some value, Jadelight Ranger is the card for you. It probably loses to Rogue Refiner for slots in the Energy decks, but I expect Jadelight Ranger to find a home at some point in a midrange deck. 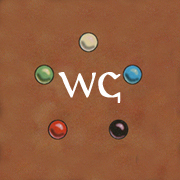 The other option is in a Merfolk deck. I expect that deck will be a little more focused on swarming instead of value, but Jadelight Ranger is strong enough that it might still find a home. Journey to Eternity is a sweet card that needs some specific help to get going. The biggest benefit would be a cheap creature that sacrificed itself for value. Something like Sakura-Tribe Elder in Modern is the best example. Once you manage to flip Journey to Eternity, you’ve got two options. The first is some kind of Reanimator strategy, cheating out big creatures from the graveyard. The other option is to use Atzal, Cave of Eternity as a value engine to slowly grind the opponent until they have nothing left. 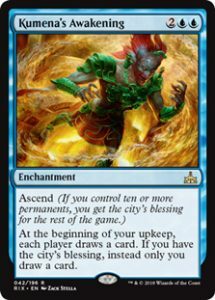 You really need the city’s blessing to make Kumena’s Awakening worth a card. Four mana for a Howling Mine is way too much. Four mana for a personal Howling Mine is a lot more reasonable. If you are playing a slower deck that generates a bunch of permanents, Kumena’s Awakening might be the card for you. Just a warning, Kumena’s Awakening is going to fight with The Immortal Sun as a card draw engine. The Immortal Sun has some other problems, but it does a lot more for your trouble. 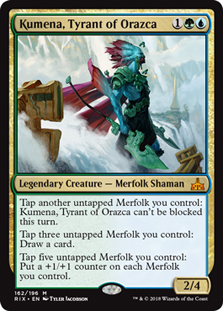 Another card that should easily slot into a standard Merfok deck, Kumena, Tyrant of Orazca is a decently strong lord. 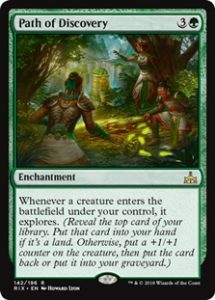 It takes a lot of cards to get creature buffs out of Kumena, but it does all sorts of good things with less creatures. 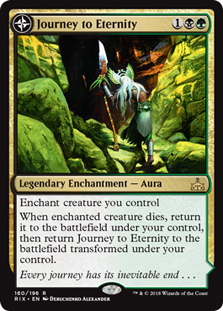 Most importantly, Kumena can draw you more cards so you can assemble a critical mass of threats. It also can sneak through for a couple points of damage if you don’t have a better option for tapping creatures. Diabolic Tutor is currently legal in Standard, so Mastermind’s Acquisition really only benefits adds the utility of pulling cards out of your Sideboard. If you really, absolutely must find a specific card in your deck, I suppose Mastermind’s Acquisition can do the job. 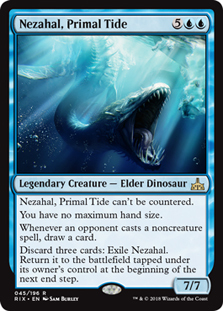 Nezahal, Primal Tide has a lot of appealing text, but I’m not exactly sure where to put it. It’s great in a control mirror, but getting it into play at sorcery speed is a challenge. You’ll need a plan for the opponent doing something like casting Approach of the Second Sun when you leave an opening. If you can solve that problem, Nezahal should serve you well. Shefet Dunes is your best friend if you’re running Paladin of Atonement. If you want to work on that mono white Vampires list from the last Pro Tour, this might be a good inclusion. Path of Discovery is some good value if you run a lot of creatures, but taking turn four off to cast it is going to be rough. If you want to consider playing it, you probably need to count on triggering it at least three or four times after resolving it to get sufficient value. 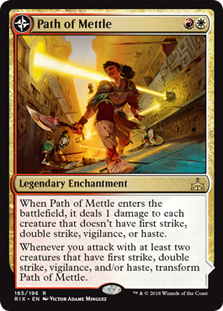 Path of Mettle isn’t strong enough to warrant a deck being built around it, but it’s a good inclusion if you naturally meet its requirements. That is a lot to ask, since you need to be Boros colors and run a lot of aggressive creatures with keywords. If you’ve got it, you can pick up a sweet land, along with clearing out any tokens the opponent might be making. Polyraptor is a brewer’s puzzle, offering some sweet potential if you jump through some hoops. 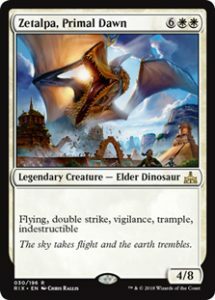 It’s probably a little too expensive for a traditional Dinosaur deck, so you should focus on the combo potential. 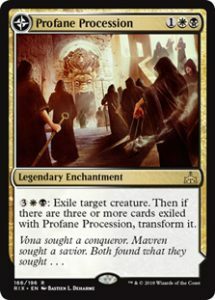 If you are searching for a card that functions as removal and a value engine, Profane Procession is a good option. Eight mana for the first exile is steep, so you’ll want a good plan for surviving an opponent’s initial rush. I wouldn’t be completely surprised to see Profane Procession in small numbers for slower matchups. This feels like a weaker Clone variant for a couple reasons. Either you can successfully activate Raid, meaning you have stronger creatures than your opponent, or you have to throw a creature away to turn on Raid. Those drawbacks seem like Vizier of Many Faces will usually take the spot for Clones. 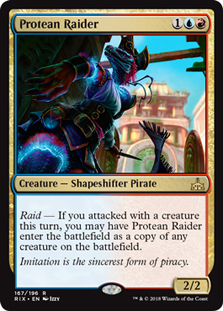 Protean Raider is really banking on the Pirate creature type and the single blue color requirement. Anthem effects are usually somewhat playable, provided the drawback isn’t too bad. 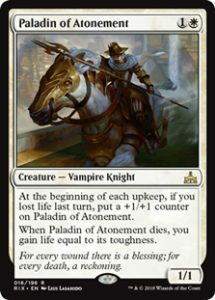 Needing to pick a creature type means that Radiant Destiny is probably only slotting into a Vampire decks right now. The Ascend trigger isn’t too bad here, as you’ll want to dump a lot of permanents onto the board to make use of the bonus already. 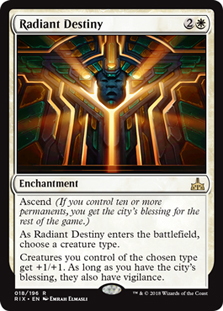 Plus, the bulk of the power of Radiant Destiny comes from the static +1/+1 before you have the city’s blessing. 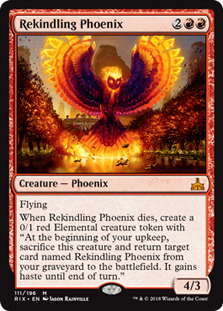 The closest thing Rivals of Ixalan currently has to a chase mythic, Rekindling Phoenix doesn’t feel like it currently has a home. 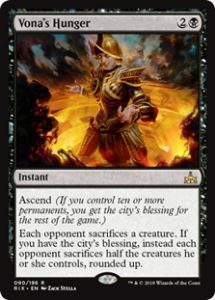 Ramunap Red currently has Hazoret the Fervent and Chandra, Torch of Defiance fighting for the top end, with Glorybringer usually coming out of the sideboard. The other big red deck, Energy, is fairly clogged between Chandra, Torch of Defiance and Bristling Hydra. Rekindling Phoenix wants a midrange deck that isn’t a slave to the Energy theme. If that exists, I would expect Rekindling Phoenix and Chandra to share the four drop spot. I suppose Release to the Wind is some kind of mix between a bounce spell and a combo card? I’ve honestly got no idea what to do with it. 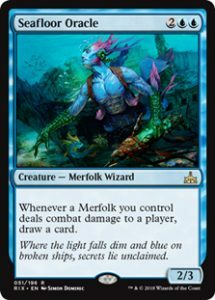 Seafloor Oracle will likely see play in small numbers in a Merfolk deck. Bident of Thassa is a good comparison, giving you a way to draw cards if you’ve already developed a board. Seafloor Oracle is weaker, but it provides another body for Kumena, Tyrant of Orazca’s abilities, which I expect to be a big bonus. 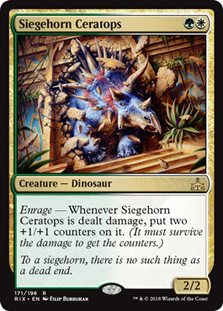 If you’ve got some method to go wide with Polyraptor, Siegehorn Ceratops can probably go equally large. 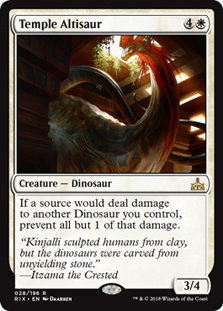 I wouldn’t be surprised to see this as a backup payoff card for a Polyraptor combo deck if such a thing exists. 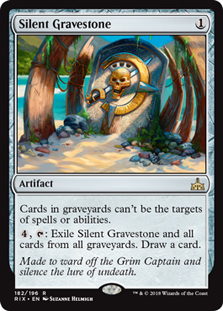 If your deck needs some answers to The Scarab God and God-Pharaoh’s Gift, Silent Gravestone does the job. It also cycles at a high cost, somewhat negating the concern about drawing multiples. That said, decks with both of those cards can probably win through Silent Grave, so you’ll need a cohesive plan instead of just relying on this shutting them down. I suppose my theoretical Polyraptor combo deck could use this as a way to neuter the opponent’s board. I think this is more of a limited card, but I suppose anything is possible. This actually looks like a fairly strong Wrath effect for a smaller deck. Slaughter the Strong is at its best against decks that only have large creatures, since you can actually force them to get rid of everything. A few turns of token generation followed by Slaughter the Strong into Radiant Destiny seems like a deck. Silence effects are typically overrated and very bad outside of dedicated combo decks. Sphinx’s Decree shuts down opponent’s plays on their own turn, which is worse for combo protection and better for messing up a turn. If Sphinx’s Decree sees some play, it’ll be a weird tempo card against a deck that mostly has instants and sorceries, like Approach of the Second Sun. Storm the Vault doesn’t really do anything besides generate tons of mana. It gives you a source of Treasure tokens and flips into Tolarian Academy for more mana. If you’re in the market for this, I expect you’re working on Revel in Riches or Metalwork Colossus. Good luck with the brewing! 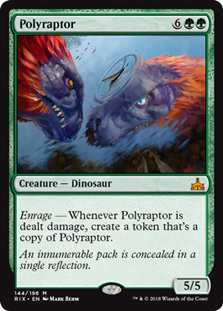 Once again, I’m going to refer to this theoretical Polyraptor deck. I’ve got no idea what else to do with Temple Altisaur. Tendershoot Dryad looks like a weaker variant of Whisperwood Elemental. It’s a five drop that can take over a game if unchecked. Unfortunately, a good chunk of the power relies on Tendershoot Dryad actually remaining in play, and everything down to Shock can kill it. The tempo loss of your five drop dying to Shock is awful, so you’ll need a plan for that. 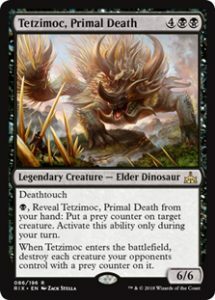 I’m pretty sure Tetzimoc, Primal Death is a decent card, but I think it gets outclassed by several other cards in Standard. Ravenous Chupacabra is the biggest offender, as the beast kills off a creature and comes down at a more reasonable cost. Noxious Gearhulk is the other contender, as kills off a creature and gains you some life in the process. Noxious Gearhulk has a worse body and a concerning four health, but Menace is much stronger than Deathtouch on a large creature. For Tetzimoc, Priaml Death to see play, you’ll need a plan to activate the ability multiple times. Fitting in the mana cost shouldn’t be incredibly hard, a single mana is fairly easy to spare somewhere on your curve. The bigger problem is surviving a hit or two of whatever you want to kill before you can actually get rid of it. Equally important is your opponent knowing that their creature has a short shelf life, so they will be more tempted to trade it off when possible. If you think you have good solutions to these problems, Tetzimoc might be the Elder Dinosaur for you. If you want value, The Immortal Sun is the card for you. I can’t imagine losing a game where you can keep this in play a few turns, as all the abilities work well together. Drawing a card is the biggest bonus on The Immortal Sun, and I’d compare it to Staff of Nin from a few years ago. The biggest problem is the existence of Abrade, giving a cheap maindeck answer to an expensive artifact that needs to sit in play for a turn or two to do anything. If you can find a plan to answer Abrade, overload it with other potential targets, or just dodge it in the right metagame, you should be able to bury the opponent in card advantage. 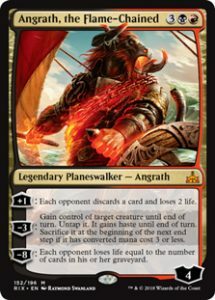 It probably goes without saying, but you’ll want a midrange deck that focuses on creatures and not planeswalkers if you are going for The Immortal Sun. Don’t neuter yourself by playing this and a bunch of planeswalkers. Tilonalli’s Summoner seems like a great card against something like Dimir control our Approach of the Second Sun. It can generate an army on its own, provided it can survive combat. Since the stats are atrocious, survival is probably happening if the opponent can’t actually block it. The ability is a good mana sink, but it’ll be much better around turn four or five. 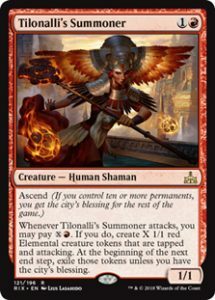 If you can get enough tokens to hit Ascend, Tilonalli’s Summoner goes from ok to great. I’m sure a Pirate deck would be happy for the shot at an extra turn, but I’m not sure how easily that deck can get the city’s blessing. 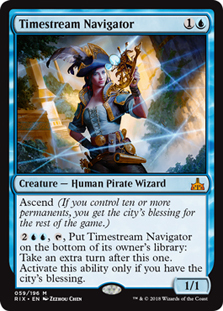 Since Timestream Navigator goes back into the deck after activating, you might be able to work out some sweet combo with Forerunner of the Coalition to continually find more copies. Timestream Navigator isn’t legendary either, so I hope someone works out a sweet plan for it. I got a chance to try Tomb Robber in the prerelease. I can assure you that it isn’t good enough as a straight value card. Flushing lands for Explore triggers is alright, but it’s not nearly good enough to justify a three mana 1/1. That means you should be using Tomb Robber as a discard outlet for something like God-Pharaoh’s Gift. Or maybe you can manage some shenanigans with Journey to Eternity. 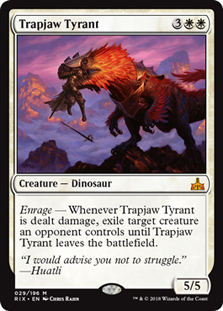 If you’ve got a reliable way to trigger Enrage, Trapjaw Tyrant isn’t the worst rate. 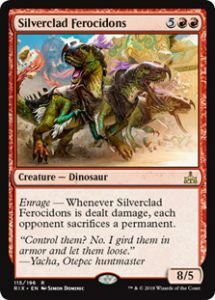 I’m not sure where this fits better than Fairground Warden unless you wanted to work on that silly Polyraptor deck I keep mentioning. Twilight Prophet is packing some serious power if you can activate the city’s blessing. I’m not exactly sure where that home is right now, since the decks that seem most likely to reach the city’s blessing don’t seem likely to want a double black card. Unfortunately, it’s necessary to Ascend with Twilight Prophet, as the card is utter garbage without the ability. 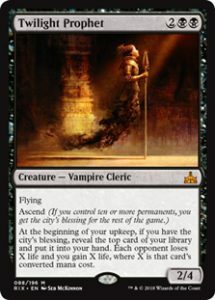 If you can manage the city’s blessing reliably, Twilight Prophet is a great source of card advantage. If a black Ascend deck exists, Vona’s Hunger seems like an ideal mirror breaker. If you can reach the city’s blessing first, you should be able to neuter your opponent’s board and keep them off it for a while longer. Beyond that, Vona’s Hunger is a sacrifice effect if you need it. Trial of Ambition is a cheaper option, but you have a chance for upside with Ascend. 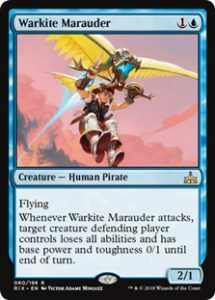 I imagine Warkite Marauder to be an important part of any Pirate deck that runs blue. As I’ve mentioned before, most of the pirates are fairly small creatures with good abilities, and Warkite Marauder makes it possible to actually attack with them. It’s also a fine body on it’s own and a great Raid enabler. 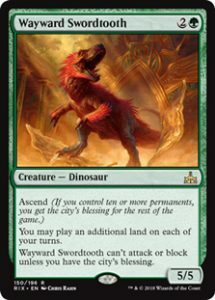 Wayward Swordtooth is very close to a three mana enchantment for extra land drops. It’s an undercosted creature, but you won’t hit the city’s blessing until a point where a 5/5 creature wouldn’t be unexpected. If you’re running this Dinosaur, you should be focusing on getting extra lands into play as fast as possible, with a possible bonus of an undercosted creature in the late game. 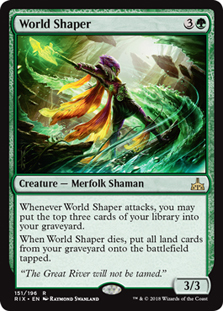 If you’ve been brewing with Splendid Reclamation, World Shaper gives you another shot in Standard. There are some fun options with cycling lands, but I’m not sure what else to do with World Shaper. Nine mana is an absolute ton, so you won’t be casually tossing Zacama into your deck. If you can actually get that much mana, you’ll hopefully be paring it with Regisaur Alpha. 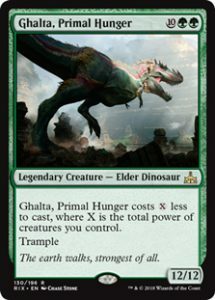 If you can toss Ghalta, Primal Hunger in the mix too, you can manage a lethal swing immediately. 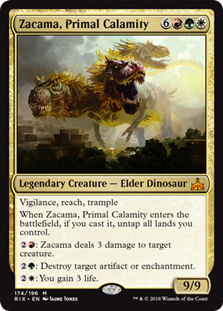 That seems a little too far into the realm of magical Christmas land, so I’m not sure where that leaves Aacama, Primal Calamity. Zetalpa, Primal Dawn is a huge threat that’s almost impossible to get rid of, barring Vraska’s Contempt. Eight mana is a ton, but Zetalpa is better than most threats at protecting itself if you go to the effort of ramping it out.